I mentioned car safety accessories in my last post. Traveling can be stressful enough as it is for pets, but we also need to think of their safety. I will talk here about accommodations for dogs to travel by car, since we haven't needed much extra protection when going by train and we have not been on a plane or boat yet with our poochies. Welcome dear furry passengers! Please buckle your seat belts and keep all your paws and noses inside the vehicle at all times! Seat belt for dogs? Yes, they exist and we have two of them and use them every time we take our dogs for a car ride. They are pretty simple to use. One side plugs into the car seat belt buckle, the other is a clasp to attach to the harness of the dog. 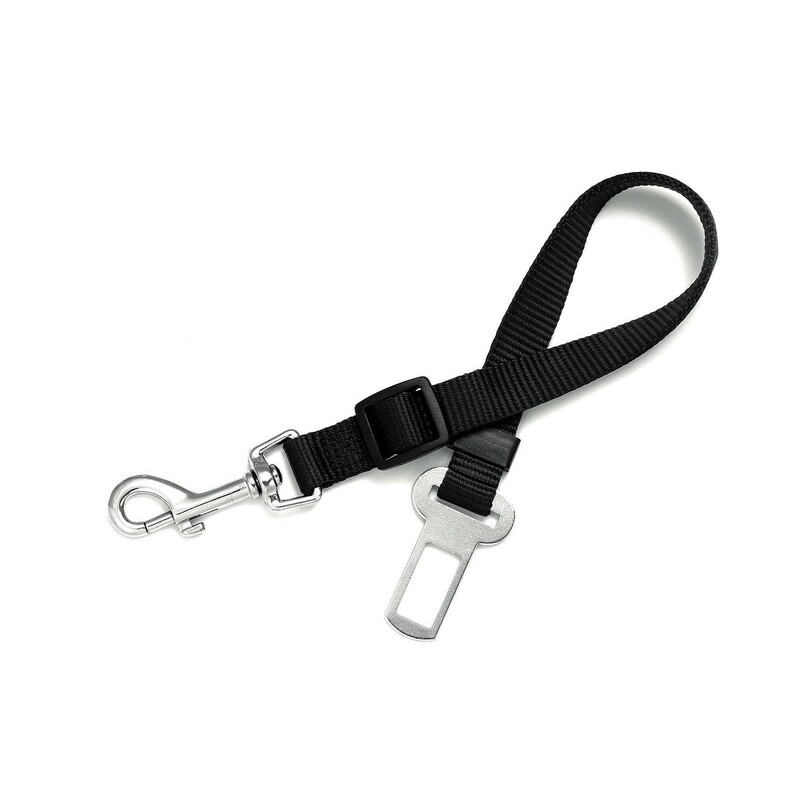 It is important to use a harness instead of a collar, since in the case of an accident the impact could be quite forceful and harm the dog's neck. The harness distributes the force better. I also saw some vests that can work instead of the usual harness, those seem much more comfortable. Of course, they should only travel in the back seat. Now, regarding keeping your noses in the vehicle... A lot of people seem to think it is fine to let their dogs take their heads out the window, but that is very dangerous. Better just to be safely strapped in the back seat. Here is an article that explains some of the dangers of doggies sticking their heads out the car window. I have mentioned before that Aschiuta has had problems with being car sick before and still is from time to time. We usually took care of this by having one person sit in the back seat with her, with plastic bag and wet wipes at the ready, watching her every drool. This was until my husband found something interesting in the pet shop... a dog car hammock. It is a protective cover that is also water proof that covers the entire back seat area and straps to the headrests and upper handles. It also has velcro openings for accessing the seat belt slots. We don't have leather seats, but they are certainly cleaner this way! I honestly do not like these, although I have seen them used by one of our vets when transporting Aschiuta to the dog hotel. They are usually kept in the luggage area of small vans, where there is more room and the cages themselves are well anchored. The dog is quite safe inside, but not too comfortable and since it will be all alone, not very happy either. Well, whichever method works best for you and your pooch, remember to stay safe! * Sorry for not having actual photos of what we bought, but these are pictures from the store where we bought them from. My babble is not sponsored in any way.